James (Jim) Mooring was originally from Piangil (near Swan Hill) and later lived in Creswick in Victoria. Jim was Carlton's 551st league player and forged a brilliant career with the Blues, playing 126 games between 1940 and 1949. Mooring, who wore #16 for the Blues, played his first match in 1940 against Geelong, kicking 1 goal from a forward pocket. Carlton won by 27 points in the first of 80 wins he would enjoy with the club. Mooring was a key player in a successful era for the Blues - delivering Carlton the 1945 and 1947 Premierships. Mooring was not just a natural on the footy field. His talents extended also to tennis (a junior champion tennis player in Swan Hill, Jim won 40 cups including the Country Singles Championship of Victoria), cricket, billiards and golf. Jim went on to enjoy the game of golf in particular, partnered by his wife Eileen, playing well beyond the age of 70 before retiring from one of his favourite activities. It is a little known fact that Mooring was invited to train with St.Kilda, but a career with the Saints (luckily for Carlton) did not eventuate as the Saints did not fulfil their promise to find him full-time employment, and he returned to Piangil. Jim later found out that the Saints, desperate to locate him, advertised in Melbourne newspapers to find his whereabouts but Jim never saw the advertisements. Jim continued to improve, starring with Maryborough the following season in the Bendigo league, attracting plenty of interest from VFL clubs Richmond and Fitzroy. Fortunately for Carlton, he ended up deciding to forge a career at Princes Park for the 1940 season - after a chance encounter with then Carlton coach Brighton Diggins in Creswick, who would have a positive and profound influence on Jim's career. Mooring accumulated a number of credits throughout his career. These including being Carlton's Best First Year Player in 1940, Most Consistent Player at the club in 1941, Best and Fairest in 1942 and 2nd Best and Fairest in 1944 as well as Best Clubman in 1943. Jim was appointed Vice-captain in 1942 and 1943, and actually acted as captain for the Blues 9 times throughout his career. In Jim's 21 matches as vice-captain, the Blues won 16 times, a testament to his leadership capabilities. Overall, Mooring kicked 161 goals in his playing career (162 goals in some records). In 1944, he kicked 42 goals to win the Club Goal-kicking Award. His next best result was 24 goals in 1943, in a season where he played predominantly as a rover for the Blues. Mooring's 1945 season would ultimately deliver plenty, though it was interrupted through injury. After playing the first 7 games (kicking 15 goals), he would miss the next 14 matches with a serious knee injury. It was a cruel blow, given his fine form in the first 7 matches. The untimely injury also ended his streak of consecutive matches at 81. Carlton had made a sluggish start to the 1945 season, winning only 2 of the 7 games Mooring had played in. Fortunately, the Blues found their form throughout the remainder of the season, winning 12 of 14 games to secure the fourth and final position on the league ladder, scraping into the finals by 1 game. With Mooring on the sidelines and his return highly anticipated by the club, Carlton easily accounted for North Melbourne in the first semi-final by 26 points. Mooring would make a triumphant return for the preliminary final against Collingwood - one of Carlton's greatest ever victories. Mooring made his first appearance in the match towards the end of the third term, due to the game being his first back from injury. It was reported that Mooring ignited the Blues, which included a "mix-up" in front of Collingwood's goal, in which Mooring proudly tells us he was involved. Amazingly, the Blues were behind by 35 points well into the final quarter. But Carlton would fight back, kicking 7 goals and 3 behinds in the final 15 minutes. Carlton defeated the Magpies by 10 points to advance into the grand final. Mooring kicked 1 goal and was hailed one of Carlton's match winners in the final quarter. Not bad for your first game back after a serious injury. Perhaps most famously that season, Mooring was a pivotal member of Carlton's 1945 premiership winning side that defeated South Melbourne in the Grand Final referred to simply as "The Bloodbath". Mooring kicked 2 goals, playing a key role in the Blues 28-point victory. The grand final was a match marred by several ugly clashes throughout which resulted in four Carlton players being reported. Mooring is immensely proud of his 1945 premiership achievement, as it would be the only premiership medal he would capture during his career (he missed out on playing in the 1947 premiership side, after playing just 5 games for the season). Various injuries (to his knee, shoulder and hand) caught up with Mooring later in his career. After playing 92 of a possible 93 games from 1940 to round 7 1945, Mooring would play in just 34 of the next 96 games from round 8 1945 to the end of 1949 courtesy of the aforementioned injuries. Sadly for Mooring and the Blues, his final outing in the famous old dark navy strip was in a 73 point defeat at the hands of Essendon in the 1949 grand final (in front of 90,453 at the MCG). Mooring accumulated 18 Brownlow Medal votes during his career - a figure which would have been higher had the Brownlow Medal not been suspended (because of the war) in Mooring's finer years 1942 - 1945. It could be argued that Mooring probably never won the full recognition he deserved because of this. Mooring kicked a career best 6 goals against Geelong at Kardinia Park during the 1944 season. He kicked 5 goals twice, 4 goals eight times, 3 goals seven times, 2 goals on twenty-six occasions and kicked 1 goal in forty-two games. In total, Mooring kicked at least 1 goal in 84 matches. A further credit to Mooring, is the fact he never played for the Carlton reserves, as he was Carlton's first choice rover for most of his VFL career and was rarely challenged for the position. 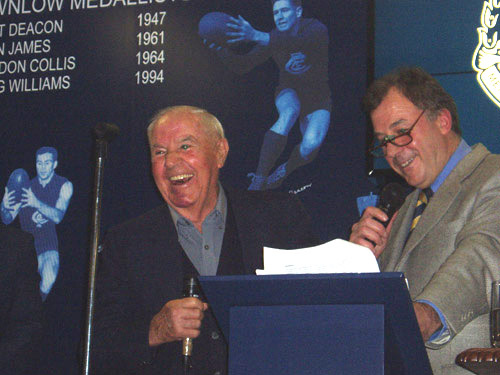 One of Jim's more recent Carlton Events was the 2005 reunion for the living 1945 and 1947 premiership players. Despite poor health at the time, Jim would not have missed the day - catching up with old team-mates and reliving the great times shared. The 'Carlton Past Premiership Players and Officials Association' organised the event and should be congratulated for putting on such a fitting tribute to all of the heroes who took part in those brilliant premiership years for the club. A picture from the memorable afternoon is attached below (Jim is pictured with Association President, Dennis Munari) with more pictures in Jim's image gallery. Mooring, a Life Member of the Blues, passed away peacefully in his sleep at the St John of God Hospital in Bendigo on October 20 2007. Jim enjoyed and cherished over 63 years of marriage to his wife, Eileen. In his latter months, Mooring was still reminiscing with family and friends about his famous footballing memories and accomplishments, and would enjoy watching his grandsons play football for the White Hills Football Club (Heathcote District Football League) between visits to doctors and hospitals. He remained fiercely loyal to the Blues to the very end, following their performances each week, enjoying their rare victories but rather typically he enjoys hearing of Collingwood losing perhaps even more. In April 2014, Jim was named as one of Carlton's 150 Greatest Players (see the article below). Jim's entire family has had the "Carlton gene" passed down - and almost without exception are all passionate supporters of his beloved Blues. After all, Jim wouldn't have it any other way. "Amidst thunderous applause, and while playing time-off, White raised the two flags to put South a point in the lead, and it looked as though it was South's game. Carlton came again, however, and forced the ball around the wing, where Linden marked. The tall chap went back to have his kick, which should have put the ball well out of danger and bought victory to South, but instead, he made an unpardonable error in attempting a hand-pass instead of kicking the ball. The ball was intercepted by Mooring, who picked it up and slammed it through for the winning goal to Carlton. There must have been only seconds to play, and South came at it again, but the bell rang out to deprive them of any chance of reprieve." "Only seconds remained, Linden obliviously was feeling the strain of the exciting finish. There were few players on the oval who were not so affected. Sensing the big chap's nervousness, Rex Ritchie ran up, told him to take his time, and drive the boot deep into the ball. Instead, Linden stopped, hesitated, and tried to handball to Vic Castles, near the centre. Castles had not "called" for the ball, nor was he expecting the punch-pass. The ball hit the man on Linden's mark. It was Mooring, one of Carlton's nippiest players and deadliest kicks. Like a flash he pounced on the leather, and drove it through for the winning goal, amidst the tumultuous cheering of Carlton's overjoyed supporters. Then the bell rang." Contributors to this page: Jarusa , blueycarlton , luke2177 , molsey , Bombasheldon , true_blue24 , WillowBlue , PatsFitztrick , pblue , p(12)terg , nikki and admin . Page last modified on Tuesday 16 of May, 2017 22:59:18 AEST by Jarusa. 1969 Rd 2 - Kennedy's Hawks badly beaten. 2003 Rd 17 - Match Preview Vs Magpies.